Biodynamics is truly a ‘holistic’ approach to gardening. It encompasses the principals of organic gardening while taking into consideration the basic cycles of nature. The goal is to restore and maintain balance and of the earth and its ecosystems. The father of biodynamic gardening, Rudolph Steiner, laid the groundwork for this new approach in 1924. A primary focus of biodynamics is the health and vitality of the soil, which has been depleted over the years by modern agriculture and the use of synthetic fertilizers, pesticides and herbicides. When the ecosystem of the soil is in balance, plants grow large and healthy and produce an abundance of vitamin-rich food. Compost is used extensively, but not always in the traditional manner. Biodynamics incorporates the use of raw compost materials. After digging a deep hole, raw compost material is added in layers alternating with fresh manure. These layers can be heaped up to about 2’ above the ground. The seed or plant is then planted. As the plant grows, it has its own supply of rich compost. Incredible results such as tomato plants as large as 12’ high by 10’ round that produce 2000 tomatoes per plant have been reported. With that kind of result you don’t need a large garden! 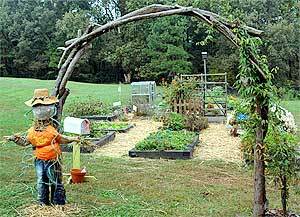 Biodynamic gardening includes a number of other practices. Among them is working with the biodynamic calendar, the Stella Natura. Biodynamic gardeners time their ground preparation, cultivation, planting and harvesting to be in harmony with the rhythms of the sun, moon and stars in order to enhance the health, vitality and success of their crops. Biodiversity is another key element of biodynamic gardening. Cover crops, crop rotation, companion planting and non-genetically modified seeds all work together to draw beneficial insects and maintain crop and soil health. All of these practices work together to produce healthy foods that are filled with valuable trace minerals which are often missing from commercial produce. Pest control, fertilization and soil revitalization are enhanced by specially-formulated Biodynamic Preparations. These unique concoctions, consisting of extracts of plants, minerals or manures, are applied at specific times of the year, usually in small, yet highly potent rates. Some are applied directly to the soil or compost while others are applied directly to the leaves of actively growing plants. To learn more about biodynamic practices you may want to visit the Biodynamic Farming and Gardening Association’s website . There you will find information about the philosophy as well as the science of this environmentally-conscious technique. For the damage we humans have done. When we see the universe is one. From the connection the ancients knew. We are all part of the cosmic stew. Thanks Fred. That article was written by a guest author but I have made the change per your comment. Thanks for writing to let us know. Am trying to share this on F.Book but the ADD to any keeps getting in the way. I’m not wanting to promote them but would like to share your lovely piece with all.